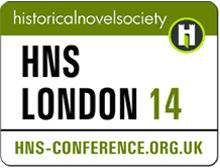 This weekend I was fortunate to spend in London at the Historical Novel Society Conference. This is the second such event I have attended and I enjoyed it more than the first (although that was fun too). This was primarily because 2 years ago I was there as a bit of a hanger on with the Indie/ self publishing table and knew almost nobody. This year I found I knew quite a lot of folk. Indeed Friday evening when I arrived the first thing that happened was that a number of Facebook friends said hello and it was good to meet folk that until now I have only just talked with online. I was also much less nervous at being amongst all these other authors because you soon release that they are actually human too! One of the factors that made me feel more conformable was that the event was launched on Friday evening with the First HNS Indie Award. This event was thought up by the wonderful Helen Hollick who is a great champion of Indie and Self Published authors and novels. The award was presented by Elizabeth Chadwick. The idea was to recognize superb Indie fiction. I was delighted to see that one of the short listed novels was by a author who has attended my UK Games Expo on the writers table: Dave Mccall – writing as Dave Ebsworth and his book Jacobite’s Apprentice. So right away it was clear that the HNS have a pretty open approach to us self published authors. I knew this to an extent already – being a HNS Indie reviewer but organizing an award was a nice reinforcement. As i chatted to folk during the Friday evening drinks session I came accross a mix of mainstream authors, fellow Indie authors and readers – all interested in historical fiction of course. The main conference took place on Saturday all day and Sunday morning. There was a conference dinner one could attend on either Friday or Saturday night at a nearby restaurant which was noisy but fun. the food was inspired by 18th century dishes. I had London Paticular pea soup and Kedgeree. 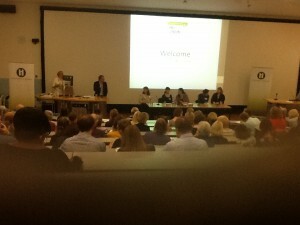 The main event however were the addresses and workshops. I will look at a few here. 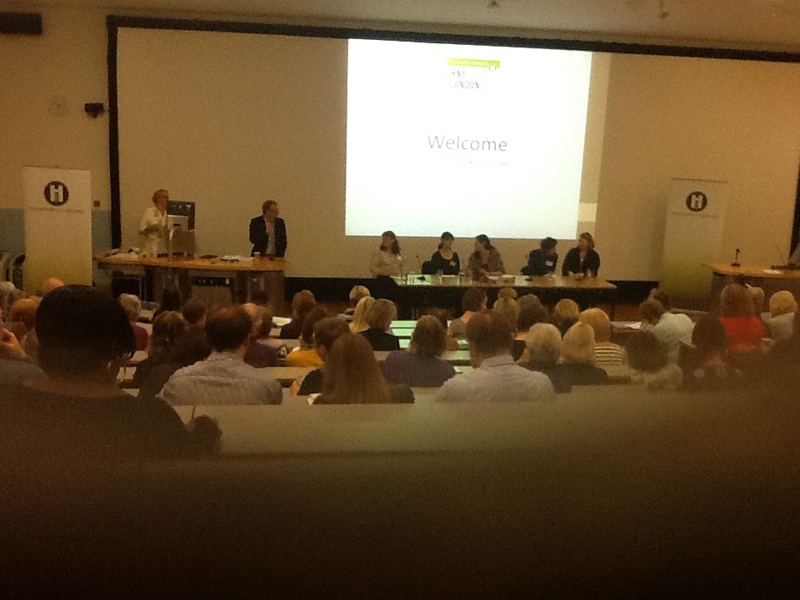 Selling Historical Fiction: the challenges and triumphs was an opportunity to hear what publishers felt worked in selling fiction. Some principles – a good cover for example clearly apply equally to INdie as to mainstream. Other comments about adverts in newspapers less so. 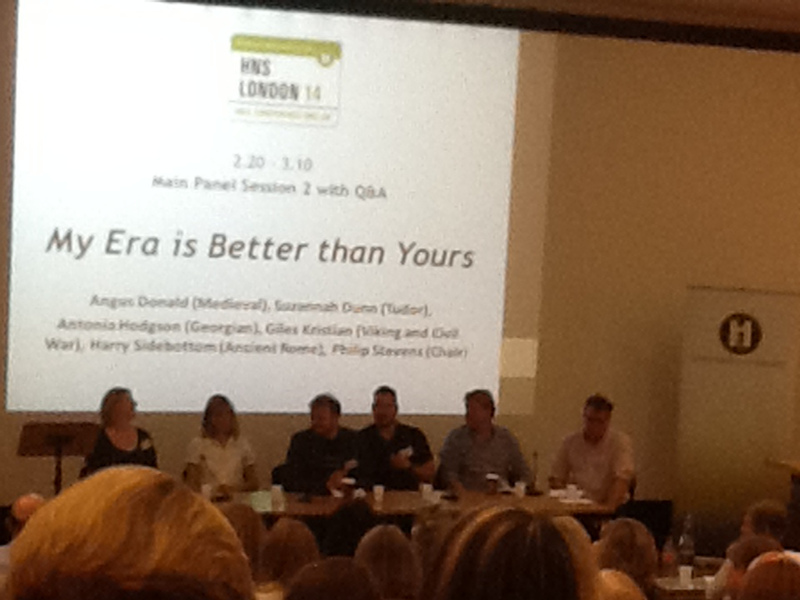 The panel was mostly publishers and book buyers for WH smith – those kind of folk. So I found that it assumed we were talking about what sells mainstream books already destined for the windows of waterstones. It would have been good to have had an indie perspective from a successful indie author as to what works for them with the harder struggle of getting recognition for them selves. Conn Iggulden’s address as guest of hour was excellent. Witty and clever, I found it useful on more than one level. I do talks at school and adult groups and found he has a natural ability to be entertaining and that I found myself paying attention to as much how he spoke as what he said. But as for what he said one message was the need for Historical Fiction Authors to make certain choices when faced with the unknowns of history. In the end we are writing fiction. It is NOT a thesis and it is meant to entertain. Academics shy away from making pronouncements when they don’t know what really happened. Fiction writers cannot not. You just have to make a choice you can defend. This was encouraging given the scarcity of known facts I have to deal with in the 7th century. I attended a workshop on Mavericks in fiction which was a useful look at the attraction of characters who stray a bit away from the norm. I also discovered a new author – Angus Donald whose Outlaw Series I will be checking out. His fellow panelist JAMES AITCHESON wrote about a Norman Knight after the conquest. It also sounded worth a look. I think my favourite session of the whole conference was the “My Era is better than yours” where 5 authors defended Ancient Rome, Vikings, The Age of Chivalry, Tudors and Georgian England. Some well thought out arguments and funny banter made this a great session. 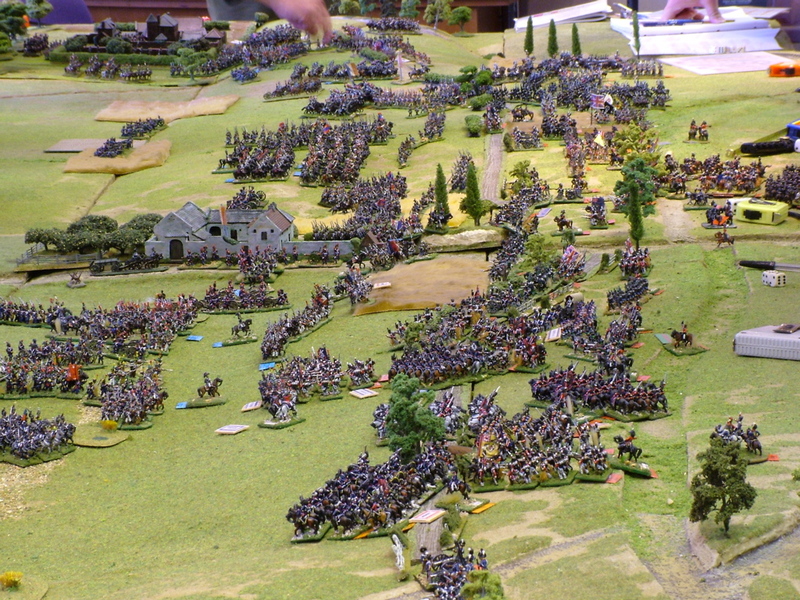 On Sunday the best session from my point of view was the Workshop on Battle Scenes. This was a well presented analysis of the elements that make for a good battle scene: the importance of research, the technology of the weapons, the terrain, the tactics used and the chance for the hero to be at the critical location. We finished with a fun quiz on historical fiction. I cant believe I forgot which Sharpe novel Isiah tongue dies in!! All in all a great weekend if you are a historical fiction writer, or trying to become one. You can meet other authors, editors etc and make some useful contacts. Roll on the next one. 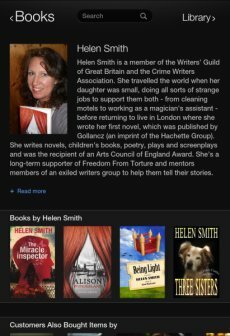 Amazon have announced that their About the Author feature is now available for Amazon.co.uk as well as .com What is About the author? Well put simply the information that an author has on their author page on Amazon will be available to owners of Kindle Fire and Kindle Paperwhites directly on their devices. So if they read an author’s book and want to know more about them including what other books are available, see your photo and biography they can do so. They can then buy those books. Authors should make sure that they have updated their page via Author Central. This should include checking they are happy with their photo, making sure all book details are correct ( including that all your books are listed). Author central can also take feeds from twitter and show videos (although these features wont show up in About the Author.). IN the US but NOT in the UK it can also take your blog feeds. Some writers can point to early success, awards and pundits for their writing from their school years. This was most certainly not the case for me. I loved reading from a very early age and can remember devouring books like The Famous Five, The Secret Seven (Enid Blighton) and The Three Investigators (Hitchcock). Anything with a mystery or from Sci Fi and Fantasy Genres was my staple diet. 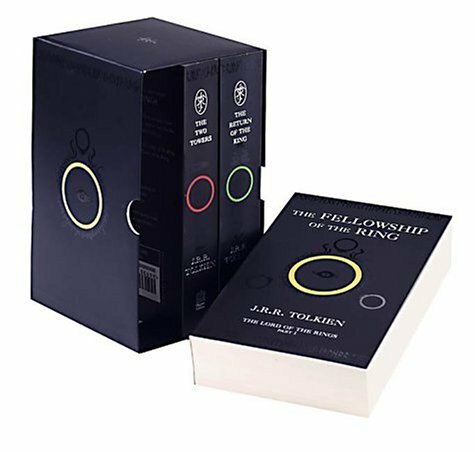 My favourite book has always been The Lord of The Rings – indeed my parents bought me a boxed set I still own as a reward for doing well at ‘O’ Levels at the age of 16. So I loved to read BUT I hated English and English Literature lessons – they just seemed to take the fun out of a good book. As such I certainly did not win any awards for my writing in my school years. This is not to say that I was not writing. My first novel (now lost) was “The insect invasion of Earth” about an invasion of giant insects and the war to defeat them. It is probably good THAT book was lost! I decided to become a doctor and went off to the university of Manchester. 5 years of medical studies were followed by several years of long hours in hospital and then finally a permanent position in a GP practice in Birmingham. Through those years I did not do any writing BUT my imagination was being stimulated still. To begin with, in my first year at university, I discovered the first of Terry Pratchett’s amazing Disk World books. I have read every one and love his writing. 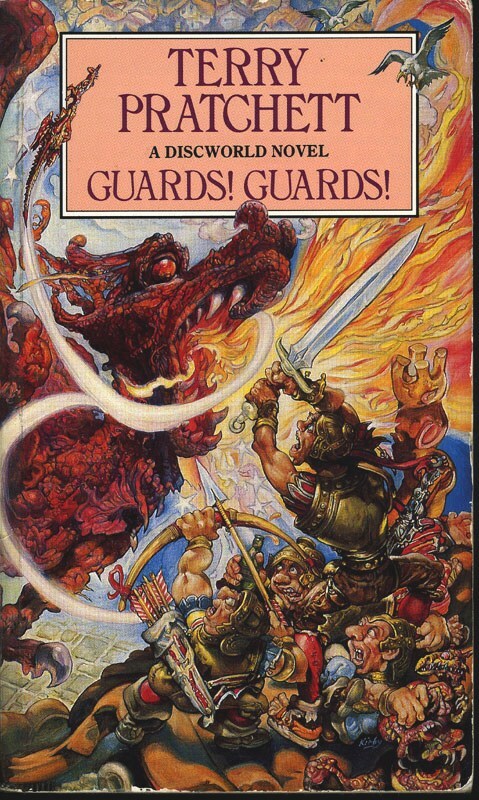 Many other fantasy books followed of which the best were by David Eddings and Raymond Feist as well as Young Adult fiction including Garth Nix’s superb Keys to the Kingdom and of course Harry Potter. At the same time I became a fan of Bernard Cornwell’s Historical Fiction and similar author’s work. I also have always been fascinated by history (despite this being another subject I did not enjoy at school) and love visiting historical sites as well as reading about them. So hundreds of books (and many holidays) later my favourite genres to read and write fall into that area of cross over between historical fiction, scifi and fantasy and Young Adult novels. Just as I spent many hours reading about these subjects my main TV and movie viewing also fall into these areas. I am really not keen on reality TV, Soap, much sport (apart from Cricket) and chat shows. On the other hand I have absorbed thousands of hours of Star Trek, Dr Who, Buffy and Angel, Stargate, Babylon 5, comedy shows like Blackadder, Red Dwarf, Monty Python and documentaries galore on the History Channel. 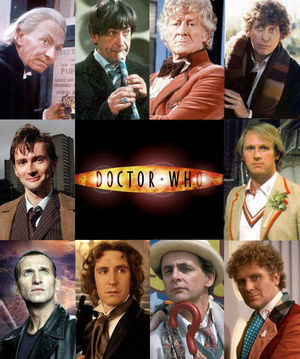 All that helped stimulate the imagination but it is playing games that brought it all together. I love board games, card games, miniature gaming and roleplaying. In particular I am a game designer and have tinkered with designs and ideas for games for many years although my first published board game only came out in 2010 – The Great Fire of London 1666. I have also run many roleplaying campaigns. When you are the “dungeon master”/ games master/ umpire or whatever you have to invent and populate the world that the players will explore. Then, as they decide what to do and where to go, you must determine who they meet and what those people want. 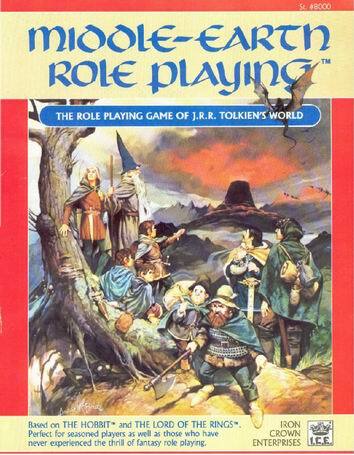 The process of running a good roleplaying game is really the same as writing a book. Having run campaigns set in Spy Genres, aboard space ships, in deep dungeons and in the Wild West (and many more) I can honestly say that I have had to come up with a lot of ideas to keep the story going. All those NPCs (none player characters) need motives, reasons to exist and thinking up those reasons is really just the same as thinking up a good character. So over the last 10 years as I started to try and write fiction all those elements – all the books, all the visits to castles and battlefields, all the movies and TV and all the games plus a fair helping of having seen a bit of the world as a doctor – all of that went in, subconsciously mostly, into the pot. I have had to learn a lot about writing and have much to learn because this process is ongoing but I hope this little piece explains something of what makes me tick. Today – December 9th in the year 1854 a poem was published in the Times which has become the most famous penned by Alfred Tennyson. It remains one of the most evocative verses relating to a battle. What made it particularly effective is that it related not to a great victory but to a disaster. Indeed it is fascinating that for a nation with s0 many moments of military success which adorn the battle honours of regiments up and down the land (Waterloo, El Alamein, Agincourt, Crecy etc) it is often the disasters or magnificent defeats which we recall the most. This is true with Dunkirk, Isandlwana and Arnhem but no more so than with the Charge of the Light Brigade. 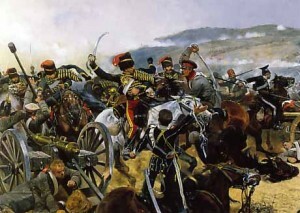 This incident involved a charge by five regiments of British cavalry consisting of the 4th and 13th Light Dragoons, 17th Lancers, and the 8th and 11th Hussars, led by Lord Cardigan against Russian forces during the Battle of Balaclava on 25 October 1854 in the Crimean War. The overall army commander was the elderly Lord Raglan who viewed the battle from a high vantage point and was somewhat removed from the location of the Light Brigade. Cardigan’s superior was the Earl of Lucan. The problem here was that Cardigan was Lucan’s brother-in-law and the pair hated each other.In such an enviroment an error of communication could easily lead to a disaster. 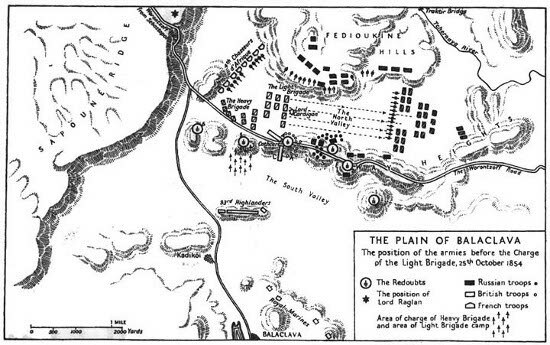 High up on his hill Raglan was pleased with an attack which had swept the Russians away from the Causeway Heights and the Southern Valley. 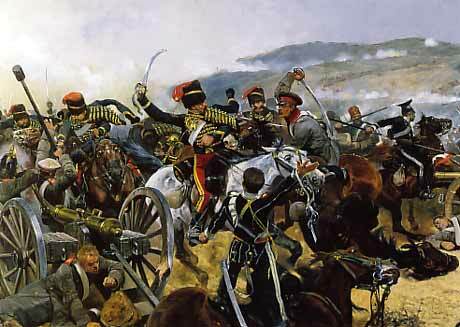 He was however concerned that the Russians were getting away with their guns and sent an order to Lucan to attack with cavalry to stop this. Lucan hurriedly sent a Captain Nolan with oral orders to Cardigan. Cardigan could not SEE the southern valley at all from his position and when he asked for clarification Nolan is reputed to have waved vaguely up what Cardigan assumed was the north valley and shouted “their are your guns, sir!”. Cardigan set off with 673 cavalry and did as instructed. He charged along the north valley. This valley was lined with no less than twenty Russian Battalions and fifty artillery pieces. The British did reach their guns but the regiments were slaughtered. Of the six hundred and seventy three men who charged down “The Valley of Death” only a hundred and ninety five survived unwounded. Nolan apparently tried to divert the charge by galloping across the front of Cardigan but he was killed early in the charge. Afterwards everyone blamed everyone else. Cardigan’s case was not helped by the fact he left the battlefield that night and enjoyed champagne on his own yacht. Rumours went about that he was not present in the charge – but he was. He might have been arrogant and a poor officer but he was courageous enough and was always at the lead of the charge. News of the calamity reached London three weeks later. The result was a huge public outcry. 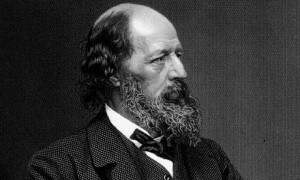 Tennyson was so upset by the disaster that he wrote his poem only a few minutes after reading an account in The Times. It was published soon afterwards and became immediately popular. In the Crimea it was distributed in pamphlet form. 6.When can their glory fade? Yesterday I visited the Eagle and Child pub in Oxford. It has long been a favourite of mine and I try and go there when in Oxford. It is a place full of interestingÂ literaryÂ and historical connections. The pub was built in around 1650. Â It MIGHT have been built a little earlier as there are stories that during the English Civil War it was used by the Â Chancellor of the Exchequer as a payhouse for the Royalist troops as Oxford was the King’s capital for most of the war. Until as recently as 2003 it was owned by University College and only sold after then to raise funds. 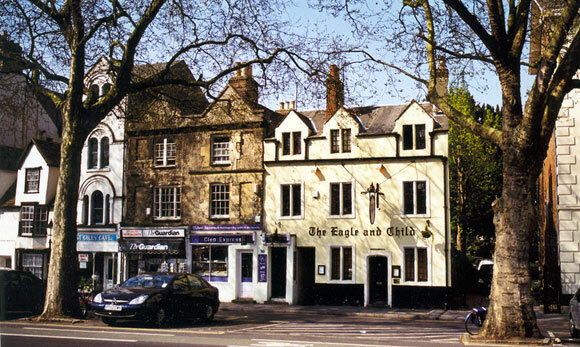 Many legends exist about the origin of the eagle and child crest of the Stanleys. One account tells of a Sir Thomas Lathom who wanted and heir but whose wife wasÂ elderly. One day, he and his wife were walking some woods when they heard an infant crying. To theirÂ surpriseÂ they find a baby boy lying in the grass below an eagle’s eyre. They took it home and raised it as their son. The pub has a room – called the Rabbit Room, which was the meeting place of the Inklings. This group of writers includedÂ C. S. Lewis, J. R. R. Tolkien, Charles Williams and Hugo Dyson. From late 1933 until the 1950s the group met every week, read to each other their books and had discussions. It was in this very room whereÂ C.S. Lewis Â first read excerpts from The Lion, the Witch and the Wardrobe. and Tolkien parts of The Lord of the Rings. Various members of the group signed a letter to the landlord one day and that letter can still be seen framed on the wall. 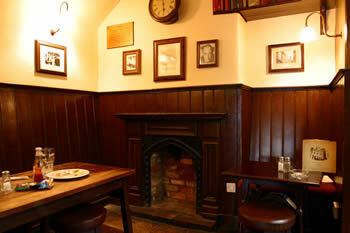 In recent yearsÂ the pub was visited by Colin Dexter, who created Inspector Morse. It is well worth a visit if you are in Oxford – and does superb food and real ales. I have two significant reasons for being thankful to Herbert George Wells (21 September 1866 13 August 1946). Firstly of course he was a writer who came out with a number of books of science fiction which along with his near contemporary,Jules Verne had influence on the evolution of the genre in the twentieth century. Secondly, although much less well known, he enjoyed the hobby of Miniature Wargaming (playing with toy soldiers) which I discovered at the age of 12 and I still pursue when I get the time. In fact I got into wargaming before I later discovered the joys of boardgames and roleplaying at university and which I tend to do more often these days. Wells was born in the town of Bromley which is near London. His father was Joseph Wells – a shopkeeper of limited financial means who supplemented his income by earnings from playing cricket. Joseph injured his leg when Herbert was in his teens and the loss of income from cricket meant that his mother Sarah had to return to work as a domestic servant. In 1874 Herbert broke his leg and spent weeks laid up at home. To pass the time he read extensively and this clearly had a good deal of influence on the young lad. Herbert’s education was restricted by the families poor finances. At times he was a student pupil -teaching younger boys as part of his payment for getting an education. He did well in Latin and the sciences. Later he was educated at the Normal School of Science in London. Between and whilst attending various schools he first worked as a draper’s apprentice and later a bookkeeper. He was never successful at these careers and eventually set out on a career as a Free lance writer. Having no money he moved in to stay with his aunt where he became engaged and married a cousin, Isabel Wells, but left her in 1894 for one of his students, Amy Robbins. he remained married to Amy until her death in 1927 but had numerous affairs leading to various illegitimate children. In 1895 Wells wrote and published The Time Machine – one of the early novels to explore this fascinating concept. Although it takes a somewhat dark view of the future (influenced by Wells own pacifist views and feelings about society and social classes) it is certainly a novel which along with the film version got me thinking about Time Travel in my own writing. The Time Machine was followed byÂ The Island of Doctor Moreau, The Invisible Man, The War of the Worlds, When the Sleeper Wakes, and The First Men in the Moon. Wells also wrote some non fiction and literary fiction – again usually commentaries on the times, war and social classes. Wells held broadly socialist views, was a member of the Fabian society and ran as a Labour candidate in two elections. He held generally pacifist view but supported the First World War and in particular rejected calls for an early peace as such peace would involve the German nation retaining control over large populations in Africa which he opposed. He had strong feelings about inequalities between classes and wrote about these at length in both his science fiction and other works. Wells believed in a One World state – gradual unification of all nations and therefore opposed Zionism as separatist and divisive in his opinion. Wells was a theist – believing in a god but denying that any one world religion is right. 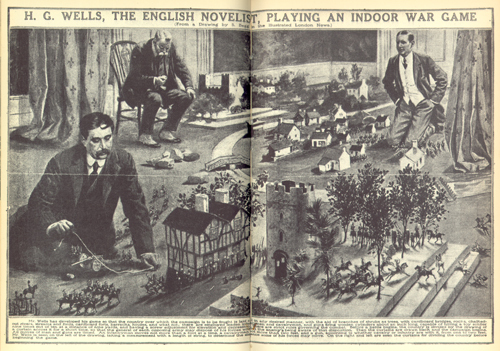 IN 1907 HG Wells produced a book about playing games with Toy Soldiers called little Wars that inspired the early generations of wargamers to get out model soldiers and start building hills and houses and rolling dice and refighting Waterloo. In later life Wells developed Diabetes and actually founded the patient support group Diabetes UK. His writing deteriorated and he became embroiled with projects and obscure problems – often pursuing local matters (such as falling out with neighbour) obsessionally. He died at the age of 79. I wrote this entry on the anniversary of Wells birthday. So thanks Herbert for the Sci-FI and the Wargames. Its your fault! Treasures of the Norse and Old English gods.